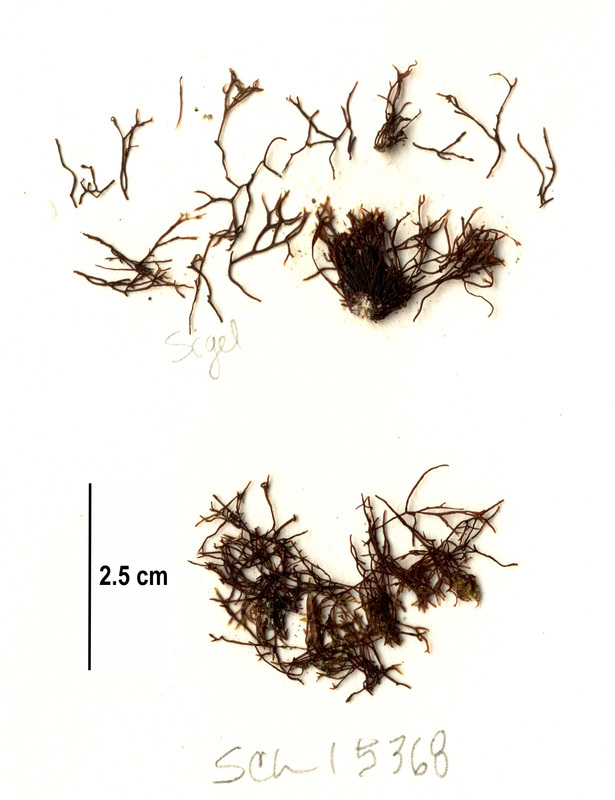 Bushy Ahnfelt's seaweed from Calvert Island beaches; specimen collection numbers SCL 15368 (below) and SCL 15007 (above) in the UBC Herbarium Algae Database. Images courtesy of Sandra Lindstrom. Search the collection numbers in the database for further details on these specimens, or search this species for additional occurrences. This perennial red alga is dark reddish-purple to black with a stiff, wiry texture comparable to that of a dish scrubbing pad. It forms tough tufts to 15 cm tall, and is composed of repeated dichotomous branching. Its branches are cylindrical in cross-section, and are quite thin: between 0.25 and 0.5 mm in diameter. Little knobs (reproductive structures) are scattered along branches. This slow-growing species grows on rock and cobble in the low to mid-intertidal, and is often surrounded by or partly immersed in sand. It is found in semi-exposed to semi-protected locations throughout its range on both sides of the North Pacific: from northern Baja California north to the Aleutian Islands and the Bering Sea, west to the Kuril Islands and Kamchatka in Russia and south to Japan and Korea. Bushy Ahnfelt's seaweed is often associated with the larger, loosely-branched loose Ahnfelt's seaweed (Ahnfeltiopsis gigartinoides) and, from southern BC south, the even larger flat-tipped forked seaweed (Ahnfeltiopsis linearis). Loose Ahnfelt's seaweed is also stiff and cylindrical in cross-section, but is obviously larger and less wiry: its branches are 1 mm in diameter and it reaches 25 cm tall. Bushy Ahnfelt's seaweed can survive while covered in sand for a substantial amount of time. Lindberg, M. and Lindstrom, S. (2010). Ahnfeltia fastigiata Bushy Ahnfelt's Seaweed. Seaweeds of Alaska. Accessed 30/03/2015. O'Clair, R. and Lindstrom, S. Ahnfeltia fastigiata (Post. et Rupr.) Makienko. In Klinkenberg, Brian. (Ed.). E-Flora BC: Electronic Atlas of the Plants of British Columbia. Lab for Advanced Spatial Analysis, Department of Geography, University of British Columbia, Vancouver. Accessed 30/03/2015.